But the drink is still easily Ireland’s top-selling cider. BULMERS CIDER MAKER C&C Group has reported a plunge in sales of its flagship brand in Ireland despite ploughing extra money into an advertising push. In a half-yearly update out this morning, the company said the volume of Bulmers it sold over the six months to the end of August was down more than 13% on a year earlier. That was despite the brand enjoying a stranglehold in the cider on-trade with 92% of the market and a still-dominant 61% share of the off-trade. The C&C Group highlighted a couple of reasons for the big drop in its Bulmers business: bad weather and competition. The company blamed a poor Irish summer, among the coldest in recent history, for at least half its drop in cider sales. This meant big challenges for brands that benefit from ‘refreshment’ and a tailwind for products with a heavier taste profile,” it said. 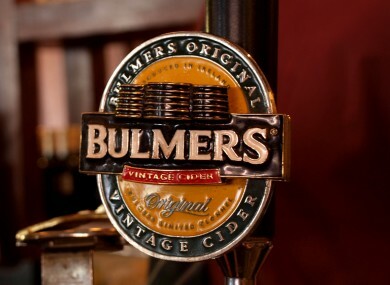 Under the banner of “new entrants”, the company also said the launch of a “competitive cider brand” and “the expansion of craft” in the pub trade had taken a bite out of its Bulmers turnover. That competitor is Heineken’s Ireland-focussed Orchard Thieves brand, which the drinks giant is importing from England. On the craft side, the output from Irish small-scale producers doubled between 2012 and 2014 – although together they represent only about 2% of the local market. The company said it had increased the amount it spent on marketing by 20% compared to last year and “brand health metrics” suggested its ‘not a moment too soon” Bulmers campaign was paying some dividends. Email “The 2 reasons Bulmers Cider has been really suffering so far this year”. Feedback on “The 2 reasons Bulmers Cider has been really suffering so far this year”.